We’re back for round three of Everyday Cosplay Inspired by Star Wars: The Force Awakens. If you missed the previous installments be sure to check out the stormtrooper styles as well as pilot Poe Dameron looks. This time I’m taking my inspiration from the jacket, shirt, and pants combo Finn wears that was on display at Star Wars Celebration Anaheim as well as other events this year. 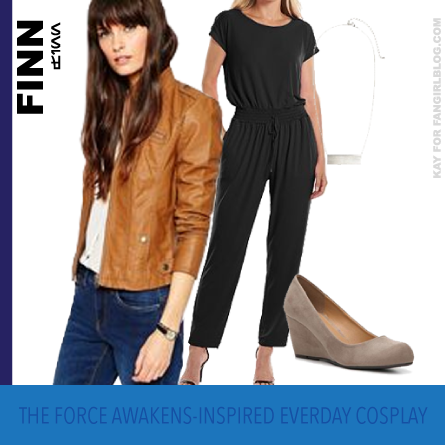 The basics for Finn’s non-Stormtrooper outfit are a brown leather jacket, brownish-taupe shoes, black shirt, and black pants. In this first casual take, we have a ponte jacket that still has a similar structure to Finn’s but serves as as an option if you don’t want to wear leather or it’s out of your price range. Since the trailers have shown Finn doing a lot of running and sweating, I chose some athletic-wear pieces for the shirt and pants. Finn’s shirt has a a texture to it that’s a good idea to carry over into your everyday look because it helps break things up a bit when you’re wearing a lot of one color. Finally the silver bar jewelry help represent the metal horizontal bar embedded in his jacket. The second Finn everyday style is a little more dressed up. Since he is wearing all one color under the jacket, it means there’s an opportunity for a jumpsuit. It’s not easy to find a brown coat with the red parts his had or with the pleating all down the sleevs, so going with a brown one that has some nice shoulder or sleeve detailing is a good way to go. We’ve also seen in stand-ups and photos that Poe Dameron wears a very similar (if not exactly the same) jacket as Finn at some point in the movie. It’s Resistance-wear chic. Poe’s color combo for his outfit is a bit more earth-toned. Slim fitting pants, brown boots, a henley or v-neck shirt are key elements for this one. And of course, we know Poe is dedicated to the Resistance so here’s another option for getting in their symbol, this time with a dog-tag-style necklace from the Kay Jewelers Star Wars collection. 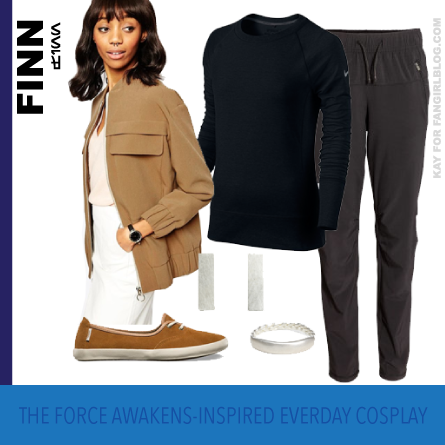 This Finn and Poe edition of Everyday Cosplay also featured pieces I found at ASOS, H&M, Nike, Kohl’s, Dog-Earred, Mod Cloth, Lord & Taylor, and DSW among others. 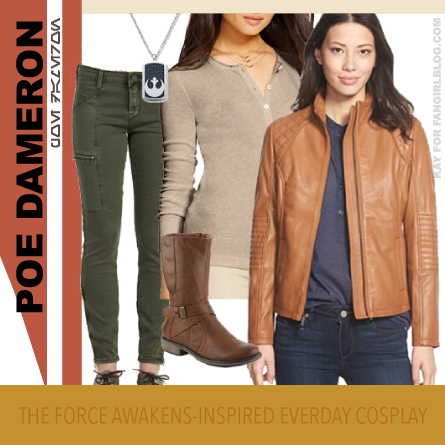 Keep an eye out for it and you can find Star Wars-inspired style pretty much anywhere. 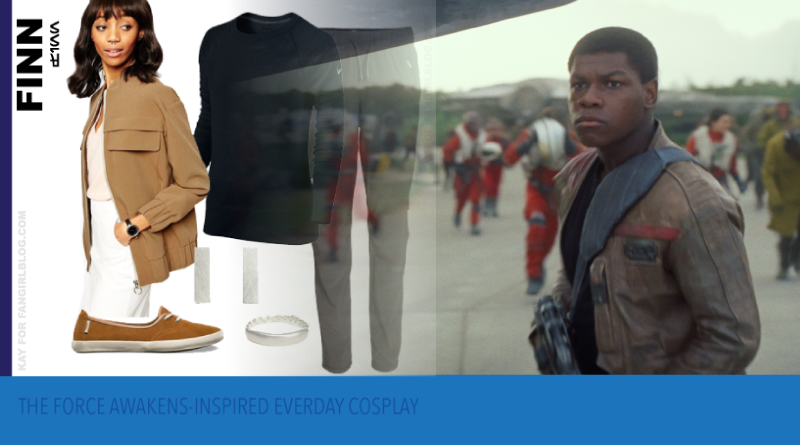 If you put together a Finn- or Poe Dameron-inspired outfit, share it with us in the comments or on Twitter using #StarWarsEveryday. Up next in my inspiration files – Captain Phasma. 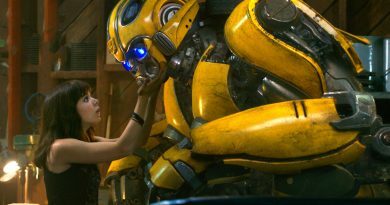 Geek Creds – Who’s Got Them? 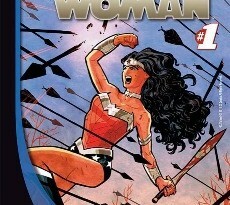 Where To Draw The Line for Wonder Woman? Introducing the GeekGirlCon Star Wars Panelists!